Want to see a cool video? Submitted by Bruce Condello, shot on his phone, off a dock in Nebraska. Nature at its best. When I watched the first part of the video, I appreciated the cool footage of a mayfly nymph that is common in our waters, likely a burrowing mayfly of the genus Hexagenia. The video is cool because you can see the gill filaments and the undulating swimming motion of that nymph. But wait! As you watch, it gets even better as the nymph magically “hatches” into the adult form! Very cool to have captured that on video! 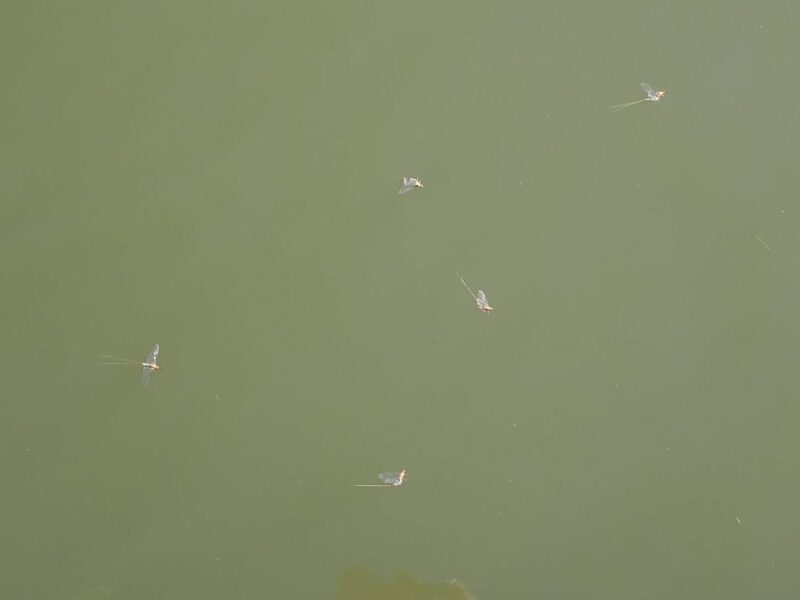 That was the genesis of this blog post and I was going to go on to explain how those particular mayflies are common in standing waters in Nebraska and they live most of their lives burrowed into the bottom substrates in those waters. The Hexagenia mayflies are among the largest mayflies, and may live an aquatic life burrowed into the mud for as long as two years. They feed on detritus, dead junk, on the bottom for those two years. 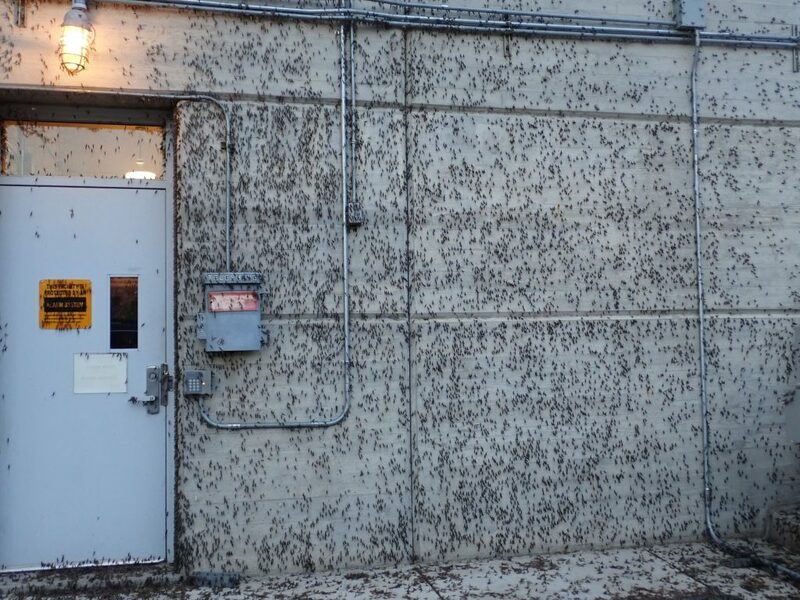 Mayflies are a good indicator of clean water and a healthy aquatic ecosystem; they can have populations of mind-boggling proportions in some waters. The density of those nymphs on the bottom of some of our waters can be hundreds per square yard! Like many things below the surface, that can be hard to imagine because we cannot see it, but when those nymphs all migrate to the surface and transform into their adult form, it can be impressive! 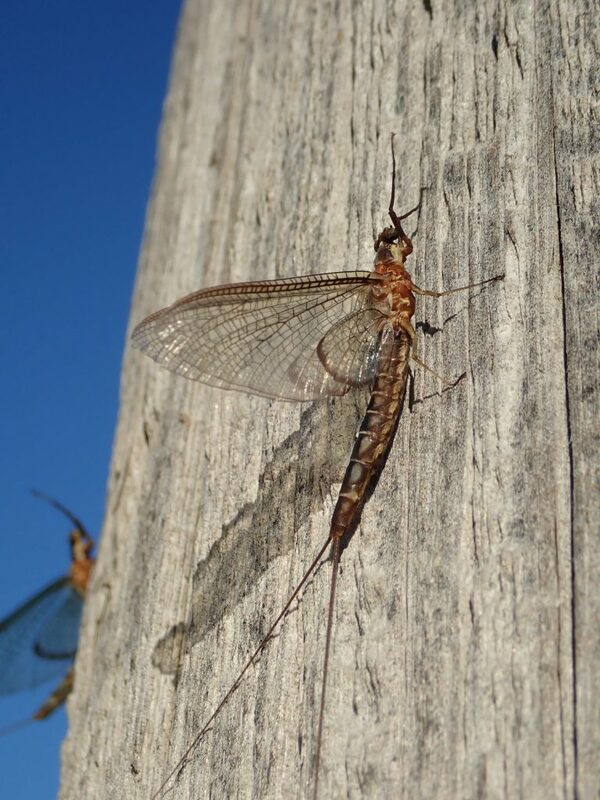 In fact mayfly “hatches” of these lake-dwelling mayflies from some lakes and reservoirs have even been recorded on weather radar–that is how many of them there can be. I got some idea of that firsthand at Lewis & Clark Reservoir recently. . . . 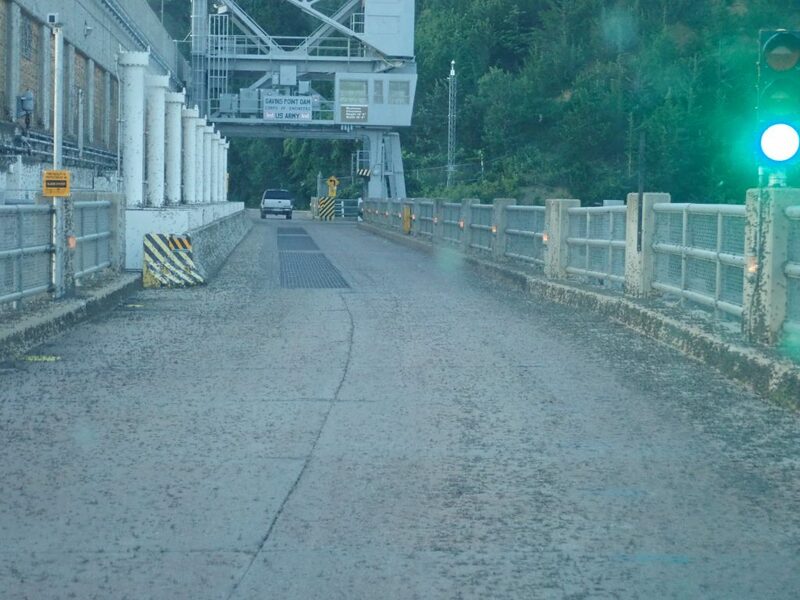 Many of you know about the road that crosses Gavins Point Dam and runs in front of the hydropower plant on the south end of the dam. The first morning as I was driving that road, it was covered with mayflies! Yes, you could hear thousands of mayflies squishing underneath the wheels! 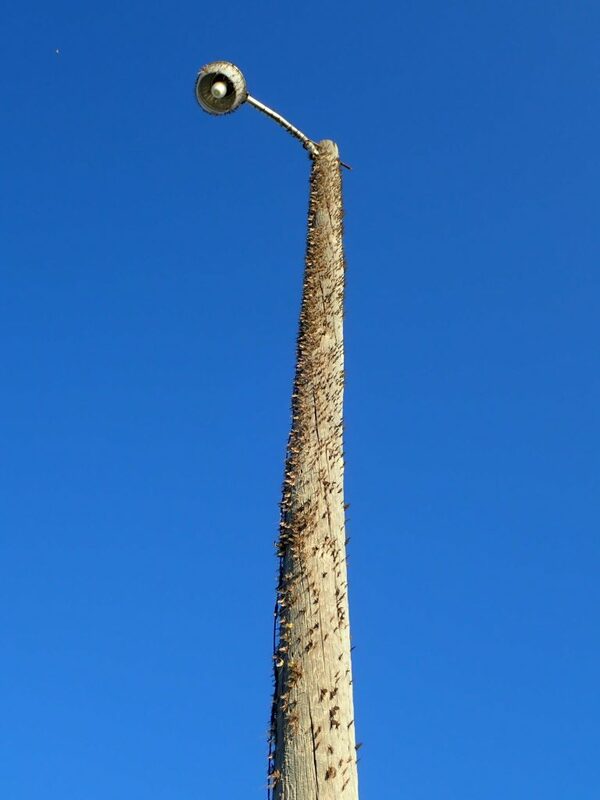 Those insects were attracted to light during the night, but they really were everywhere. This gives a whole new meaning to May(fly) Pole! That gives you an idea of the thousands, maybe millions of the nymphs that can carpet the bottom of some of our waters. Obviously, those aquatic insects can be a very important part of the aquatic food web, and you better believe a whole bunch of fish love to eat the nymphs. There can be some feeding activity on the adults as well. Speaking of adults, you will notice two distinct colorations in this photo. I am not going to proclaim an expertise in aquatic insects in general or mayflies in particular, but those are the same species of mayfly, Hexagenia limbata, and I believe the color difference is due to an unique feature of the life cycle of mayflies. You already know that the nymphs “hatch” into the adult form; in mayflies that initial adult form is called a subimago or dun. Then, a few hours later the adults again molt into the ultimate sexually-mature adult form, imago, or spinner. The adults only live for a matter of hours, maybe a couple of days, in which they mate, deposit eggs and die. Mating occurs in the air, and I saw one or two coupled together but could not capture a photo of them. From what I read, mating does not last long. During the day it seemed the adults were resting in grass, bushes, trees, as I said, everywhere. When disturbed they would launch into the air for a short flight. I believe mating flights occured mostly after dark, and I wonder if it was the males that would fly then, displaying and looking for females? 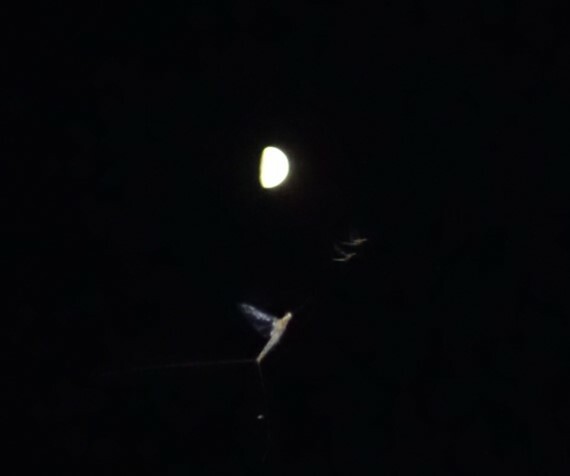 After dark you could see mayflies bobbing up and down several feet into the air. Males die after mating while the females deposit eggs over the water or onto the surface of the water before they also die. Each female can deposit thousands of eggs. 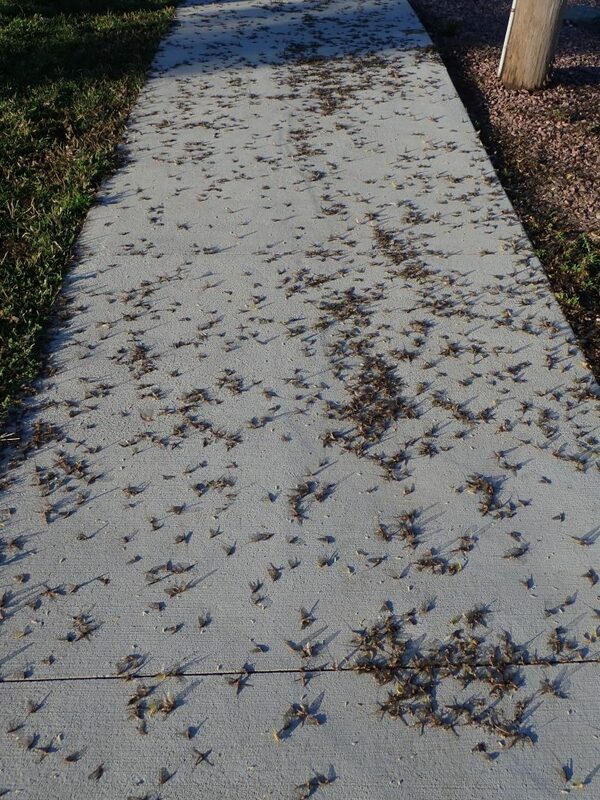 When the sun was up, you could see dead mayflies floating everywhere. Let me finish this by bringing it back to fish! Obviously, the mayflies can be a big part of the diet of several species of fish, especially at certain times of the year. The nymph stages are present below the surface all the time, but especially may become a targeted food item when they migrate towards the surface to “hatch” into their adult form. 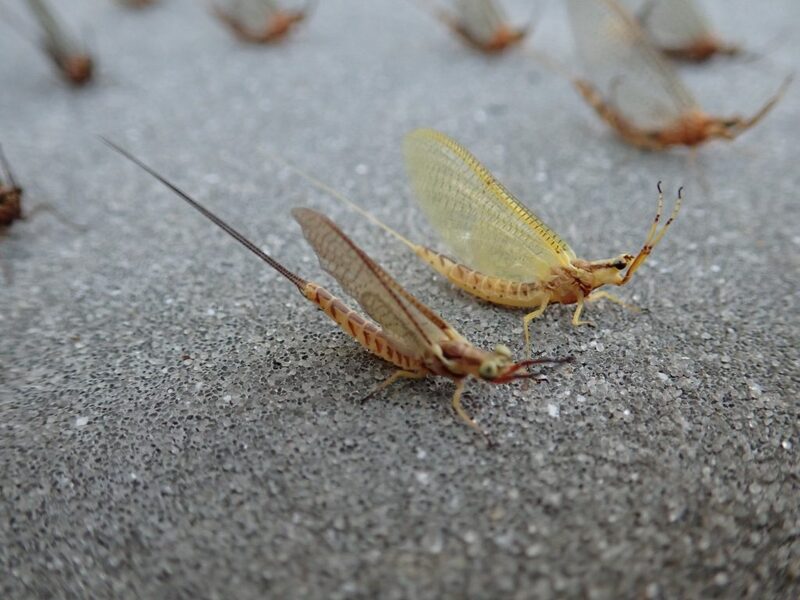 Many of you already know that trout anglers are very interested in the biology of these aquatic insects and at times may need to be precise in imitating the “hatch”. Believe me, I have only scratched the surface and you might be interested in additional research and resources like can be found here, The Catch and The Hatch Online Entomology Course (you can take a free look at the chapter on mayflies right now!). 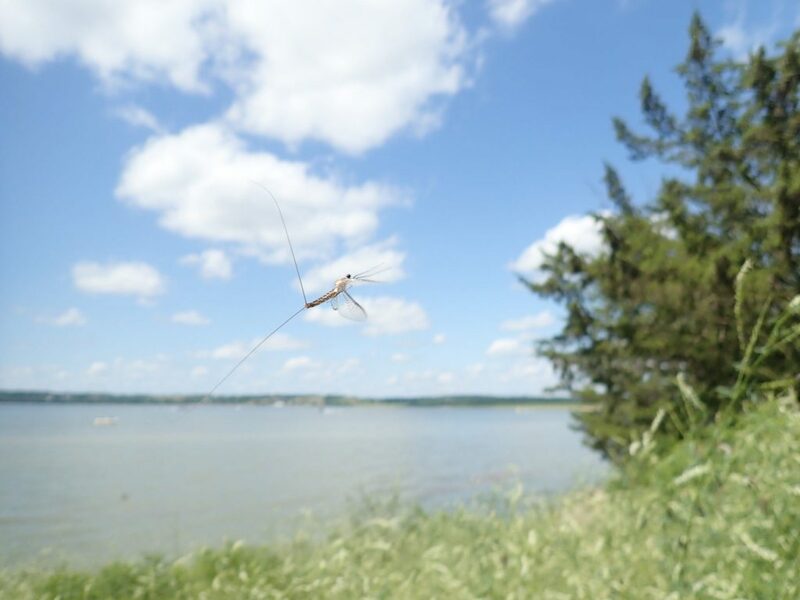 Coolwater and warmwater fish can also key on mayflies in lakes, reservoirs, pits and ponds, especially when something like the Hex hatch is happening. Yes, that means the best presentation for those fish may be a fly rod with some sort of nymph that imitates the large, undulating nymphs. Dry flies that imitate the spent adults can also be effective. Walleye anglers often complain about a tough bite during mayfly hatches. Walleyes will slurp the nymphs. Walleyes can even be caught on flies at those times, but not many walleye sticks fancy themselves as fly anglers. If you go back to the video, remember that the nymphs migrate towards the surface with an undulating swimming motion. Small leeches can scratch some walleyes during the tough bite of a mayfly hatch because those leeches imitate the mayfly nymphs in size, color and swimming motion. Slowly swimming dark-colored marabou jigs can be another presentation used to imitate the nymphs without breaking out the fly rod. Oh, one last thing I should mention, for those of you that don’t much care for “bugs”: Mayflies are completely harmless, and I think, really cool creatures!